It has recently been announced that a new semi-annual channel release for System Center is available. As you can see in the following picture, the new System Center 1807 is the last release before GA of SC 2019. So, my recommendation is to implement this release and test it before going further . In short, you have a plenty of time to evaluate the newest SC and prepare your staff for SC 2019 deployment in production. 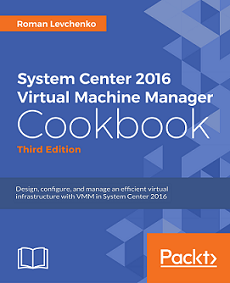 In this post, we will cover the major changes for VMM. When you add a new VHD to the existing VM, you can now define CSV path (a new volume) for that disk to eliminate problems with storage space. Prior to VMM 1807, a new VHD of an existing virtual machine would be placed in the same CSV as the other VHDs, aggravating the problem if the CSV was already running high on utilized storage. VMM 1807 allows you to convert a switch embedded teaming (SET) switch to logical switch by using the VMM console. In earlier versions, this feature was supported only through PowerShell script. VMM 1807 supports VMware ESXi v6.5 servers in VMM fabric. This support facilitates the administrators with additional flexibility in managing multiple hypervisors in use. To evaluate SC 1807, you can download SC 1801 from here , and then update to 1807 (SAC) + it also will be available @MSDN. In addition, VMM 1807 has received SQL Server 2017 support. I’ve recently configured VMM in the restricted environment where you always need to ask IT staff to delegate rights for service and install accounts in order to make SQL Server and VMM Server working. The requirements for DKM container or SPN registration are described at many sites, blogs including official Microsoft docs, but I faced with a new problem just after VMM installation. System.AggregateException: One or more errors occurred.—> Microsoft.VirtualManager.DB.CarmineSqlException: The SQL Server service account does not have permission to access Active Directory Domain Services (AD DS). Ensure that the SQL Server service is running under a domain account or a computer account that has permission to access AD DS.